52 Hereford (303-305 Newbury) is located on the NE corner of Hereford and Newbury, with 50 Hereford to the north, 62 Hereford to the south, across Newbury, 301 Newbury to the east, and 53 Hereford to the west, across Hereford. 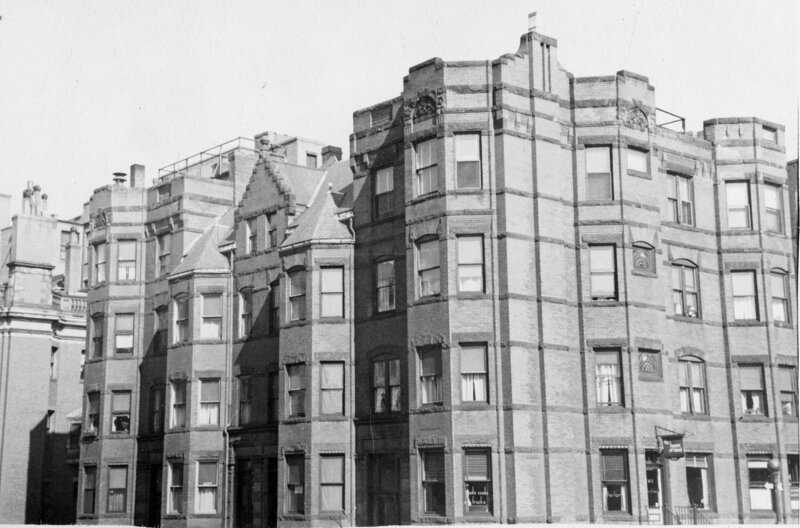 52 Hereford was designed by Ernest N. Boyden, architect, and built in 1885-1886 by Albion Knowlton, builder, for Edwin B. Horn, Jr., a jeweler and real estate developer. 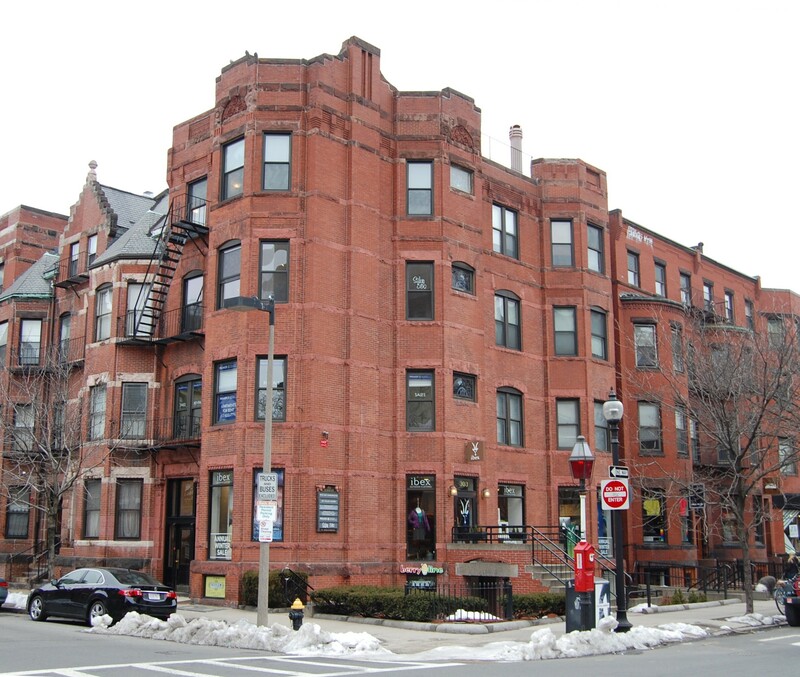 It was one of four contiguous buildings (46-48-50-52 Hereford) built for Edwin Horn, designed as a symmetrical group, with 48-50 Hereford a symmetrical pair of single-family dwellings, flanked by 46 Hereford and 52 Hereford, each a four-family apartment building. Edwin Horn is shown as the owner on the original building permit applications for 46, 50, and 52 Hereford, all dated May 7, 1885 (the application for 48 Hereford has not been located). Edwin Horn purchased the land for 46-48-50-52 Hereford on April 21, 1885, from Caleb H. Warner and Charles F. Smith, trustees. The parcel had been part of a tract of land originally purchased by Nathan Matthews on January 2, 1871, from David Sears, Jr., Frederick R. Sears, and Knyvet Sears. Click here for an index to the deeds for 52 Hereford. Edwin Horn sold all four of the buildings after they were completed. In the deeds, he included a four foot wide easement across the rear of 46-48-50 Hereford to provide access to the alley. 52 Hereford was built as a four-unit apartment house, called The Hereford. On December 11, 1885, 52 Hereford was purchased from Edwin Horn by Barthold Schlesinger, an iron and steel merchant, who bought it as an investment. He and his wife, Mary (McBurney) Schlesinger, lived in Brookline. 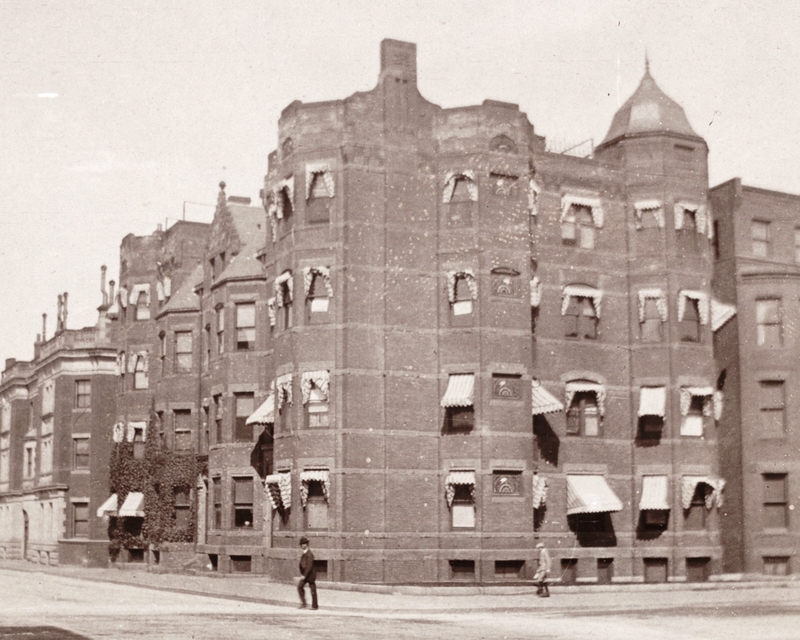 On May 13, 1891, 52 Hereford was purchased from Barthold Schlesinger by Albert Geiger, a real estate developer and investor with whom Barthold Schlesinger had been associated in several apartment house projects, among them 290 Commonwealth where Albert Geiger and his wife, Emma (Pfyffer) Geiger lived. On March 26, 1892, 52 Hereford was acquired from Albert Geiger by Isabella (McLean) Keith, the widow of Martin Luther Keith. She lived at 216 West Chester Park. On December 16, 1893, 52 Hereford was purchased from Isabella Keith by Anna Gertrude (Child) Whittemore, the wife of real estate and insurance dealer Samson Dunham Whittemore. 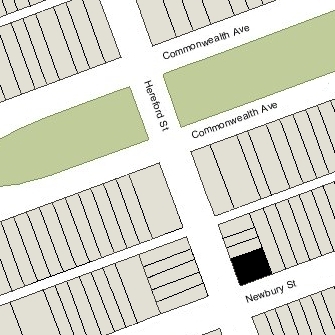 He was an early developer of Newton Highlands, where they lived (according to his December 28, 1922, Boston Globe obituary, he was “the man who gave that section of Newton its name”). On February 15, 1923, 52 Hereford was acquired from Anna Whittemore by real estate dealer James M. Burr. The property changed hands and on April 1, 1924, was acquired by real estate dealers David Shikes and Philip B. Long. 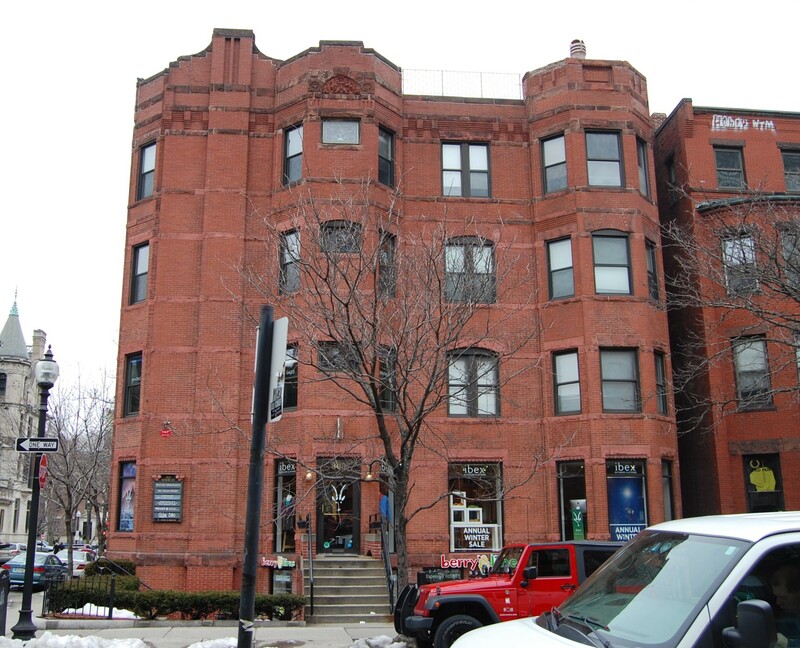 In July of 1924, they applied for (and subsequently received) permission to convert the property from four apartments into two retail stores (on the basement and first floor levels) and four apartments. Plans for the remodeling are included in the City of Boston Blueprints Collection in the Boston Public Library’s Arts Department (reference BIN E-9). On October 14, 1931, the building was damaged by a fire that started on the first floor. On January 4, 1943, the Suffolk Savings Bank for Seamen and Others foreclosed on its mortgage to David Shikes and Philip Long and sold 52 Hereford to real estate dealer Howard S. Cosgrove. On January 8, 1943, it was acquired from Howard Cosgrove by Harry Saftel, Alexander Beal, Joseph Goodman, and Nathaniel A. Golden, trustees of the Ray-Lee Trust. On August 31, 1944, 52 Hereford was acquired from the Ray-Lee Trust by Tillie Berman, wife of Walter Berman, a grocer. They lived in Mattapan. In May of 1949, the Bermans applied for (and subsequently received) permission to convert the property from two retail stores and four apartments into two retail stores and eight apartments. On November 11, 1951, the building was damaged by a fire in a third floor apartment. On April 30, 1963, 52 Hereford was acquired from Tillie Berman by Catherine M. Durant, an office secretary with the Talanian Realty Company. On April 7, 1966, she transferred the property to Charles Talanian of Talanian Realty, and on December 31, 1979, he transferred it to Chatal Associates Limited Partbership, of which he was the general partner. In June of 1983, Charles Talanian applied for (and subsequently received) permission to convert the property into two retail stores and six offices. 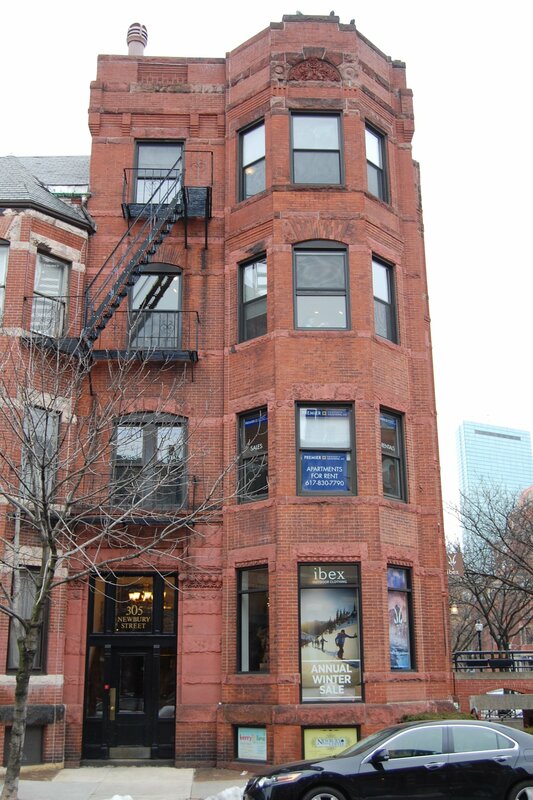 On June 18, 2008, Chatal Associates transferred the property to 305 Newbury LLC (C. Talanian Realty Co., Inc., manager of record). 52 Hereford remained a combined commercial building and multiple dwelling in 2017.